October 1st, 2005. Good day today! got up by 5am and tried to get riding by 6:30am . Off by an hour, we were out the gates of the palace hotel by 7:30am. Got some chai on the way a couple of hours later and had some sandwiches we had packed up from the hotel. 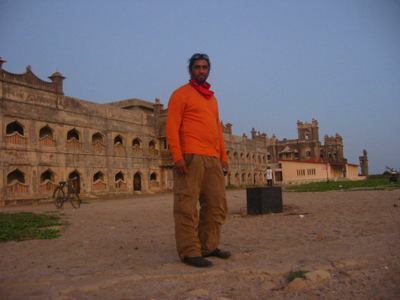 We made it to Diu, (an union territory, which was under the Portugese rule till the 60’s along with Goa and Daman. ) for lunch. (see photo. 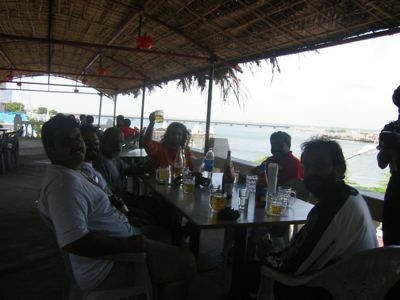 from left: Naveen, Amit, Navroze, Bari, Joe, Rakesh, Dinesh). 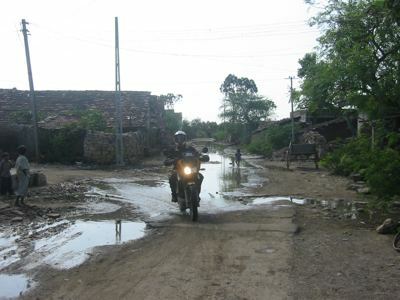 After a 2 hour lunch we hit the road and very soon got lost in a village with roads that are well… (see photo). We pulled over and Navroze asked an elderly man dressed in traditional garb and a massive head dress and topped and RayBan sunglasses for directions. He looked at us and told Navroze that we seemed hopelessly lost and that we should come to his place have some roti (bread) , milk and some rest and then he’ll direct us to where we need to go. The people have been very kind and friendly. 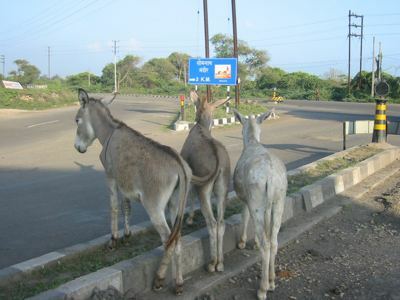 We got back on the road towards the next town Viravar where we were waiting for the jeeps to catch up. 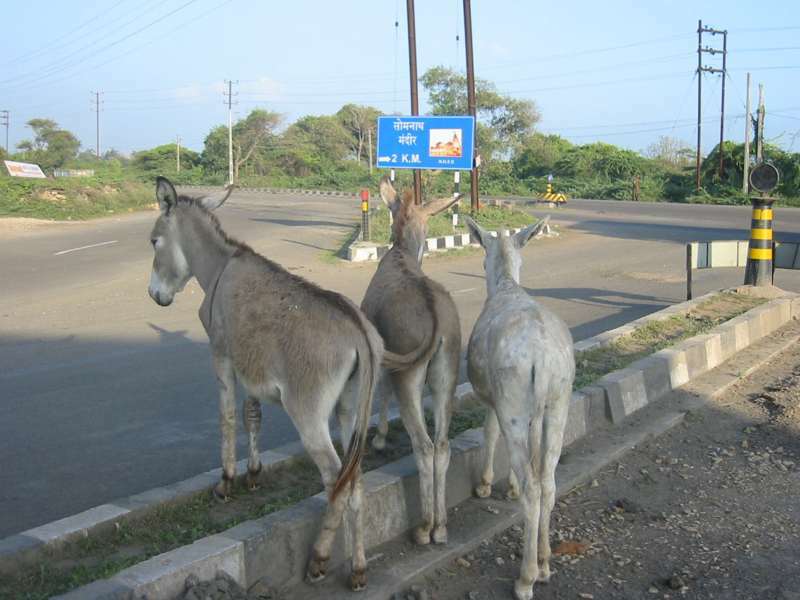 (See photo of 3 asses). We weren’t too far from our final stop for the night, Charwad. We got here by sunset and it is quite lovely. We are staying in a couple of cottages on the beach right next to the ruins of the old palace (see photo). The weather during the day is quite hot and humid and now in the evening, the ocean breeze is cooling us off. Soon we shall have dinner and hit the sack soon for another early rise tomorrow. Looking forward. Posted by Bari on Saturday, October 1st, 2005 at 8:57 am. under Motorbike Diary. hello from sweaty silver lake. i love reading your posts. dreamy fix. the rayban/turban man reminds me of when i got lost in ireland once on a bicycle. it was raining and we asked this old bloke with a plastic bag on his head if he could help us find our destination. he said he wasn’t familiar with it, but “sure - you’ll know where y’are when ya get der.” genius!! Hello my friend. It looks as if you are having a great journey. It looks amazing. All is cool here. I just wanted to let you know that we hung your painting. It looks AMAZING! I’ve reworked the room to give it it’s own world. I hope you’ll like it when you get back. We hope that you have a great day and I will check in later. All the best! Nice bike, to bad about the driver. Good to c some Rishivalley Friends making it on this parikrama. We are all proud of you guys. Great posts and love to read the next post. So great to follow this journey with you guys! The pictures are wonderful; Charlie’s Angels, Indian style, you being Farrah of course! Woke up about 5am; the fog in Pasadena was thick and ghostly, reminding me of my first early morning in Delhi. Keep an eye out for those fish in the sky! Are those your backup vehicles? Whatever you do, best to circumvent any circumstances that involve circumcising them or it could get ugly….